Many charitable organizations send letters in December, asking us to support their work. From Habitat for Humanity to Save the Whales, they hope the feelings of the season (and the thought of an end-of-the-year tax deduction) will spur us to be extra charitable now. And yes, you’ll receive a letter from Rodeph Torah, too – if we don’t ask, we don’t get! But I would like to ask a different question: not what will you give?, but what really matters to you? On Rosh Hashanah I spoke about “Judaism without Guilt,” and many of you told me that you love the idea. So why not expand it to encompass giving, too? Instead of giving because a letter or a commercial makes you feel bad, why not take the initiative and give to causes that make you feel good? Whether you are able to give a little or a lot, there is more to “Tzedakah without Guilt” than meets the eye. Take TRT as an example. Let’s say you have $50 to give to tzedakah, and you think you may want to give it to the temple. Rather than just writing a check or going online to make a contribution, I suggest you sit down with the list of temple funds – it’s in this newsletter, and it’s online – and see what each of them does. 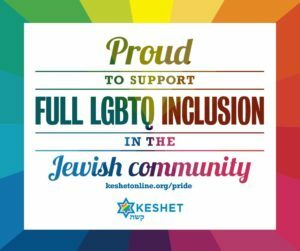 Do you like the idea of educating the next generation through our Center for a Jewish Future? Your gift can support that. Would you like to grow our youth programming? You can direct your contribution to that specific goal. Do you believe in our Social Action work, or our beautification projects, or helping high school students get to experience Israel? It’s all there, and you can designate your gift to do something you want – something that matters to you. Can you give more? You can sponsor a Rock Shabbat and see and hear the results in a hundred people lifting our voices in song and prayer. Speak to Cantor Alexander and she’ll tell you how. Or do what Shira and I do, and join the Compassionate Circle: TRT’s way of making sure we never turn anyone away from our community because they cannot afford to belong. We do this because it makes us feel we are making a difference. I know that all the families who are Compassionate Circle members feel the same way. If you have the ability to do even more, I invite you to speak with me personally. We can custom-design ways for you to put your money to work in something you find satisfying and fulfilling. An example: one temple family has taken on sponsorship of the 10th Grade trip to the Religious Action Center each year, making this unique program affordable enough for everyone to participate. Is there something we do that you would like to underwrite? Talk to me; we can make it happen, even if it has never happened before. One last thought: you don’t have to do this alone. Would your parents, or your siblings, or even your grown children like to join with you in holy work? You’ll never know unless you talk with them. I’ve said many times that families are not only defined by where we live, but also by what we care about and what we believe in – that is, by what really matters to us. Why not sit down as a family and talk about where you’d like to make a difference in the temple, and in the world? Whether you choose to give to TRT or to any other worthy cause, I hope you will consider this approach. Don’t give out of guilt; as with Judaism in general, there are too many positive reasons to be involved to have to drag out guilt as your motivation. Give because the cause matters to you; give because you believe in what you’re doing; give because the thought of giving makes you happy. And if you would like to make Rodeph Torah the beneficiary of your giving, please let me know how I can help. It would be my pleasure to assist you, because what we do at TRT really matters to me. I wish you and your loved ones a happy Hanukkah. May the gifts you receive and the gifts you give bring you joy.